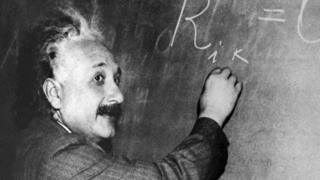 Newly published private travel diaries have revealed Albert Einstein's racist and xenophobic views. Written between October 1922 and March 1923, the diaries track his experiences in Asia and the Middle East. In them, he makes sweeping and negative generalisations, for example calling the Chinese "industrious, filthy, obtuse people". Einstein would later in life advocate for civil rights in the US, calling racism "a disease of white people". This is the first time the diaries have been published as a standalone volume in English. Published by Princeton University Press, The Travel Diaries of Albert Einstein: The Far East, Palestine, and Spain, 1922-1923 was edited by Ze'ev Rosenkranz, assistant director of the California Institute of Technology's Einstein Papers Project. Einstein travelled from Spain to the Middle East and via Sri Lanka, then called Ceylon, on to China and Japan. The physicist describes arriving in Port Said in Egypt and facing "Levantines of every shade... as if spewed from hell" who come aboard their ship to sell their goods. He also describes his time in Colombo in Ceylon, writing of the people: "They live in great filth and considerable stench down on the ground, do little, and need little." But the famous physicist reserves his most cutting comments for Chinese people. According to a piece in the Guardian about the diaries, he describes Chinese children as "spiritless and obtuse", and calls it "a pity if these Chinese supplant all other races". In other entries he calls China "a peculiar herd-like nation," and "more like automatons than people", before claiming there is "little difference" between Chinese men and women, and questioning how the men are "incapable of defending themselves" from female "fatal attraction". Noted for both his scientific brilliance and his humanitarianism, Albert Einstein emigrated to the US in 1933 after the rise of Adolf Hitler and the Nazi party. The Jewish scientist described racism as "a disease of white people" in a 1946 speech at Lincoln University in Pennsylvania. Einstein's theory of relativity changed how people thought about space and time but these diaries demonstrate how his own personal views about race seem to have altered over the years. The writings may have been intended as private thoughts but their publication will upset some in America, where campaigners still celebrate Albert Einstein as one of the voices that helped shine a light on segregation. When he moved to the US in 1933 he was taken aback by the separate schools and cinemas for blacks and whites and Einstein subsequently joined the National Association for the Advancement of Colored People. He is said to have told people that he saw similarities in the way Jews were being hounded in Germany and how African-Americans were being treated in his new homeland. He chose Lincoln University in Pennsylvania, a historically black college, to give one of his most damning speeches just a year after the end of World War Two. His diaries are full of gut reactions and private insights. In the context of the 21st Century they may tarnish the reputation of a man who is revered almost as much as a humanitarian as a scientist. But the words were written before he saw what racism could lead to in America and Germany - a country he had effectively fled.